In 1964 I designed my first fuzz guitar effects pedal that was used by Jimmy Page and Big Jim Sullivan and featured on many early hit records. I am pleased to announce that after 40 years this early ground breaking fuzz will be available again. It uses carefully selected germanium transistors and has the same distortion section as the original 1964 version. An added carefully tuned passive fatness control follows the distortion section and this adds fatness without messing up the guitar's detail or the distortion characteristics. It has all the features of the new Vision Series with Hard Wire and Buffered Dual Outputs and is housed in the same style of new enclosure. This reissue meets our strict guidelines of keeping the best of the old but also adding some new noteworthy modern features and we at Roger Mayer welcome you to step on to a piece of genuine history. This sets the amount of distortion. A combination circuit tailored to provide control to the overall tone depth and is not just a simple top cut circuit. The output level boost available can also be used to drive the amplifier very hard if required. 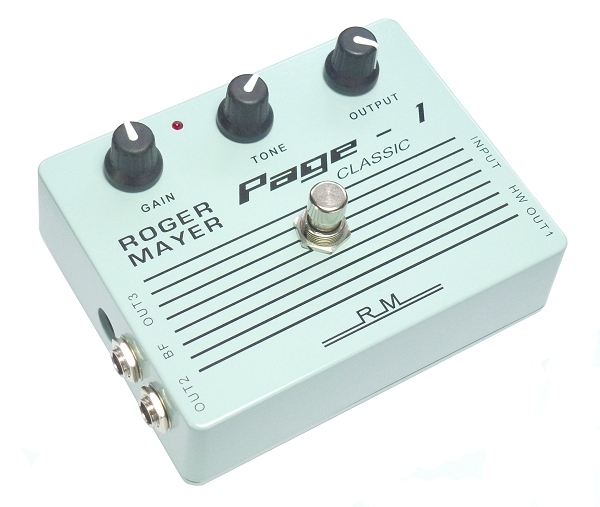 The Page-1 Classic has a true hard wire output plus two buffered outputs that can drive long cable lengths with no high frequency loss. These buffered outputs are disconnected when the hard wire output is being used. This means that all performance situations are catered for whether you want a true hard wire output or your situation calls for the advantages of buffered outputs.